eduClipper - clip anything, share everything - more info available now. 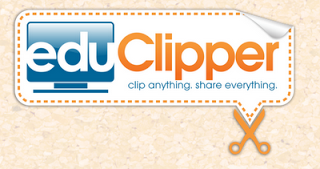 eduClipper is a new app coming from EduTecher Adam Bellow that I wrote about last month. eduClipper is in sign up mode now and promises to provide a way to clip anything from the web and then share it with anyone. It's free and allows you to clip and capture anything from the web including articles, links, videos, lesson plans and more. You then create a clipboard to organize what you have clipped and then you can share the clipboards with students, colleagues, the public or just keep it for yourself. Students can use it too and the clipboards are searchable. You can also share your clipboards via different social networks. Knowing Adam, this will be a great resource for educators and students. Sign up to be notified when it's ready to go.